Although typically only philosophy students study Socrates, his teachings are form-fit for college. 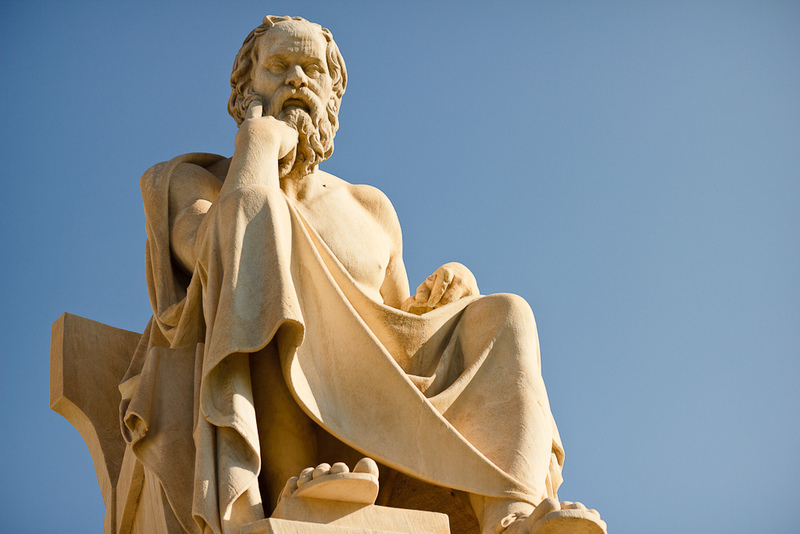 Although typically only philosophy students study Socrates, his teachings are actually form-fit for the college experience. There’s a reason that one’s college years are often fondly remembered as the best years of one’s life—college is a lot of fun. It’s our first real taste of adult independence. It’s a chance to live away from home for the first time and be who we want to be without our parents breathing down our necks. As I approached the day when I would move into my dorm, I eagerly anticipated this liberation, this ability to control my destiny and decide who I wanted to be. However, I was at the same time more anxious than I ever have been in my life. I realized, even before I was actually at college, that liberty always comes at the cost of responsibility. The terrifying part of the freedom that we experience in college is that the decisions we make here will impact how the rest of our lives play out. My choice of major, the friends I make, the summer job I work—all of it will impact my future in ways that I cannot possibly predict. It seems that all this liberty has a very significant and very scary dark side. In four short years, it seems that I have to figure out who I am and what I want to do with my life. The same thing that makes college so awesome is also what makes it terrifying. This is where Socrates comes in. Socrates is generally considered to be the first ever philosopher. He was known for engaging in what is now known as the Socratic Method; he persistently asked annoying questions to reveal contradictions in the beliefs of his peers, thus exposing their hypocrisy. Socrates targeted in particular the high and mighty in society with this persistent form of questioning, invariably defeating their arguments and leaving them rather confused. He is also known for a rather idiosyncratic vision of wisdom. Where most people would associate wisdom with an abundance of knowledge, according to Socrates, the highest form of wisdom is knowing that you don’t know anything. So how does Socrates have anything to do with college? Too often, we forget that philosophers, particularly ancient philosophers, were concerned with teaching people how to live good and meaningful lives. It can often seem that an ancient Greek like Socrates is hopelessly out of touch with the concerns of the modern day, but the lessons he imparted in ancient Athens all those millennia ago were not restricted to that time period for the simple reason that human beings have not changed much since the fourth century BC. All the same issues we face today—rampant careerism, duplicitous politicians, unwinnable foreign wars—they all afflicted the Athenians. So, no matter whether you’re a philosophy nerd like me, a science geek or a star athlete, here are three pieces of wisdom from the philosopher himself that you can (and should) take to heart. As I mentioned before, not only did Socrates question the particularly learned members of Athenian society, he targeted them specifically. The rough equivalent to the college professors of today in Socrates’ time were the sophists. The sophists were philosophers (in only the loosest sense of the term) who taught that truth was not objective, but relative. In other words, according to the sophists, truth for me may be different from truth for you. Given this, they taught that the best way to live one’s life was to seek pleasure, money and power, and in Ancient Athens, the route to all of those things was a political career. Consequently the sophists were masters of rhetoric; after all, if the truth is not objective, then it is only what we make of it. All the wealthiest families in Athens had their sons educated by sophists (who charged handsomely for their services) and so this ideology had become widespread. Socrates opposed it bitterly, and he would say so at some length to anyone who would listen. In fact, while on trial for his life (more on that later), Socrates publicly dismantled the arguments of his prosecutors, all highly respected Athenian gentlemen. The point is this: Authority is often used to discourage questioning, but we don’t have to let it intimidate us. If we are to use our time wisely while in college, we should never fear to question the opinions of a professor rather than simply regurgitate what we are told. Trust me, having done this myself a few times, if you’re asking honest questions you will more often earn your professors’ respect than their wrath. In sharp contrast to the sophists, Socrates lived very modestly. Where the sophists charged an exorbitant fee for their teaching services, Socrates charged nothing at all. In fact, he probably lived most of his life in abject poverty. Socrates sought not to become wealthy, but to cultivate virtue, and he was acutely aware of the fact that wealth does not do that. Sometimes, it can seem like college is all about becoming the next Donald Trump. We are constantly told that we have to land a good internship to make us attractive to potential employers, that we have to pick a major that will prepare us for a high-paying career, that [insert college here] is remarkably successful in preparing its students for lucrative professions. Socrates would remind us that if we wish to be truly happy, the health of our souls must come first. College, though on the whole a lot of fun, is undeniably stressful. We are constantly inundated with tests to study for, papers to write, and books to read. It all takes a toll on our mental health. Whenever we are stressed, we would do well to remember that it could be far worse. In fact, it really was far worse for Socrates. After years of practicing the Socratic Method, Socrates’ enemies became predictably annoyed. In fact, they became so annoyed that they put him on trial for polluting the minds of Athenian youth. 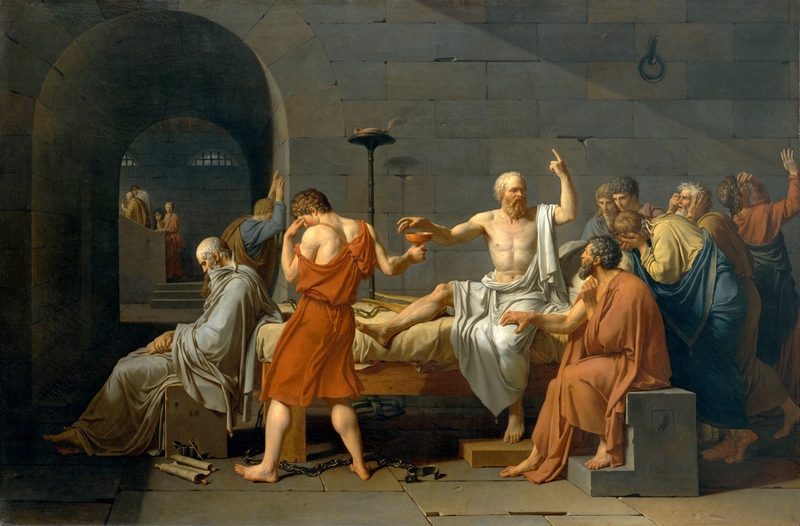 If convicted, Socrates would be executed. In spite of this, he remained unflappable. He stayed true to his principles, questioning his prosecutors exhaustively in the same persistent style as he always did. He remained virtuous the whole way through, and for that he was convicted and sentenced to death. When the time came for him to be executed, Socrates accepted his death without fear or regret, because he knew he had lived a good life, and so he had no reason to fear its end. All of this places our troubles in a different context. Even if I bomb this test, life will go on. All we can do is face the troubles of the present moment with serenity, knowing that they cannot overcome us if we choose to live virtuously. Remember, you don’t have to be a philosophy major to appreciate the wisdom of Socrates. His wisdom was never meant to be taught in a stuffy classroom by a professional professor, it was meant to be lived by ordinary people. So do yourself a favor and allow Socrates to change your life for the better. I certainly know he has changed mine.